You are welcomed to attend this special Latin Mass every Sunday at 1:00 p.m. If you would like assistance in your celebration at the Latin Mass, you might consider purchasing a copy of “Latin-English Booklet Missal for Praying the Traditional (1962) Mass" (Published in November 2008). This 68-page booklet is available for $5.95 by clicking here (X). Fr. Robert Bishop, C.M.F., the normal celebrant for the Latin Mass, will also preside--by request--at Latin Rite Baptisms, First Communions, and Weddings. If you would like to celebrate one of these Sacraments in the Latin Rite, please click on the link FORMS (located in the column to the left under LATIN RITE), and then select the appropriate form, complete it, and return it to the the office or email it to the secretary (denisekay@hotmail.com). You will need to contact Fr. Bishop to see if he will be available for the date you need. His phone number is (310) 631-5981, ext. 45. For Latin Rite Baptisms, you must first receive permission by the Pastor. Also, both the child's parents and godparent(s) are required to take the class we offer at St. Therese (in English) (dates and additional information is available under Sacraments > Baptisms). For both Latin Rite Baptisms and First Communions, you must also speak with Fr. Bishop to set up the date to receive the Sacrament and, in the case of First Communion, arrange for your child to receive the proper catechesis. LINK TO A VIDEO FOR THE CARMELITE SEMINARY: If you would like to view a video that our Carmelite Seminary produced, click on the word LINKS (to the left). HISTORY OF THE CELEBRATION OF THE LATIN MASS AT ST. THERESE: St. Therese Church began celebrating the 1962 Latin Mass shortly after June of 2007 when Pope Benedict XVI approved a document, Summorum Pontificum, that relaxed restrictions on celebrating the Latin Mass. The Latin Mass was originally developed in the 16th Century and was used continually by the Roman Catholic Church up until the modernizing reforms of Vatican II in the 1960s. The Vatican Council II reforms called for Mass to be said in local languages, for the priest to face the congregation instead of facing the altar with his back to worshippers, and for the use of lay readers and extraordinary ministers of the Eucharist. Along with approving Summorum Pontificum, Pope Benedict, in an accompanying letter to the world’s bishops, stated that the 1962 edition of the Roman Missal is to be considered as an "extraordinary form" of the Roman Rite, of which the Missal, as revised by Pope Paul VI in 1970, is the ordinary, normal or standard form. As a result, some refer to the 1962 Tridentine Mass as "the extraordinary form" of the Mass. The 1962 Tridentine Mass is also referred to as the "usus antiquior" (older use) or "forma antiquior" (older form), to differentiate it from the newer form of the Roman Rite in use since 1970. Pope Benedict’s 2007 decision was widely seen as an attempt to reach out to the Society of St. Pius X and bring it back into the Vatican’s fold. The late Archbishop Marcel Lefebvre founded the Society of St. Piux X in 1969 in Switzerland in opposition to the Vatican II reforms, particularly its liturgical changes. The Vatican excommunicated Lefebvre in 1988 after he consecrated four bishops without Rome’s consent. The bishops were excommunicated as well. Pope Benedict has been keen to reconcile with the group, which has demanded freer use of the old Mass as a precondition for normalizing relations. Some cardinals and bishops, particularly in France—where Lefebvre’s group is strong—objected publicly to any liberalizing of the old rite, saying its broader use could lead to divisions within the church, and could imply a rejection of other Vatican II teachings. Other concerns have come from groups involved in Christian-Jewish dialogue, because the Tridentine rite contains prayers that some non-Christians find offensive. The Tridentine liturgy predates the landmark documents from Vatican II on improving relations with Jews and people of other faiths. The Tridentine Mass is the form of the Roman Rite Mass contained in the typical editions of the Roman Missal that were published from 1570 to 1962. It was the most widely celebrated Mass liturgy in the world until the introduction of the Mass of Paul VI in December 1969. In nearly every country in the world, the Mass was celebrated exclusively in Latin, but the use of many other languages was authorized both before the Council of Trent and in the course of the succeeding centuries leading to the Second Vatican Council. The term "Tridentine" is derived from the Latin word Tridentinus, which means "related to the city of Tridentum (modern day Trent, Italy)". It was in response to a decision of the Council of Trent that Pope Pius V promulgated the 1570 Roman Missal, making it mandatory throughout the Western Church, excepting those regions and religious orders whose existing missals dated from before 1370. Other names for the Tridentine Mass include “Traditional Mass” and “Latin Mass”—though the revised form of the Mass that replaced it has its official text in Latin, and is sometimes celebrated in that language. In Masses celebrated without the people, Latin Rite Catholic priests are free to use either the 1962 version of the Tridentine liturgy, or what is now the "ordinary" (normal) form of the liturgy. These Masses "may—observing all the norms of law—also be attended by faithful who, of their own free will, ask to be admitted." Permission to use the Tridentine form in parish Masses may be given by the parish priest. The most widespread term for the rite, other than "Tridentine Mass", is "Latin Mass". However, the Mass of Paul VI is published in Latin in its official text, and is sometimes celebrated in that language. Occasionally the term "Gregorian Rite" is used when talking about the Tridentine Mass, as is, more frequently, "Tridentine Rite". Pope Benedict XVI declared it inappropriate to speak of the versions of the Roman Missal of before and after 1970 as if they were two rites. Rather, he said, it is a matter of a twofold use of one and the same rite. The Tridentine Mass is divided into two parts, the Mass of the Catechumens and the Mass of the Faithful. Catechumens, those being instructed in the faith, were once dismissed after the first half, not having yet professed the faith. Profession of faith was considered essential for participation in the Eucharistic sacrifice. This rule of the Didache is still in effect. It is only one of the three conditions (baptism, right faith and right living) for admission to receiving Holy Communion that the Catholic Church has always applied and that were already mentioned in the early 2nd century by Saint Justin Martyr: "And this food is called among us the Eucharist, of which no one is allowed to partake but the man who believes that the things which we teach are true, and who has been washed with the washing that is for the remission of sins, and unto regeneration, and who is so living as Christ has enjoined" (First Apology, Chapter LXVI). The participation of the congregation at the Tridentine Mass is interior, involving eye and heart, and exterior by mouth. Except in the Dialogue Mass form, which arose about 1910 and led to a more active exterior participation of the congregation, the people present at the Tridentine Mass do not recite out loud the prayers of the Mass. Only the server or servers join with the priest in reciting the prayers at the foot of the altar (which include the Confiteor) and in speaking the other responses. 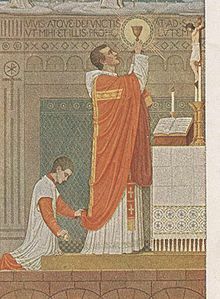 Most of the prayers that the priest says are spoken inaudibly, including almost all the Mass of the Faithful: the offertory prayers, the Canon of the Mass (except for the preface and the final doxology), and (apart from the Agnus Dei) those between the Lord's Prayer and the postcommunion.